“I thank to the citizens of Belgrade and Serbia for their warm welcome. I am very happy that I have the opportunity to visit the friendly, sister country of Serbia, as well as to have talks on what we have achieved, and what will we achieve”, said Russian president Vladimir Putin during his visit to Belgrade today. Talking to his Serbian counterpart, Aleksandar Vucic, in the Presidential Palace, Putin said: “Dear mister president, in recent years you did a lot for the development of the Russo-Serbian relations; today I will have the great opportunity to deliver you the state reward for your contribution, for everything you did”. Putin decorated Vucic with the medal of the Order of Aleksandar Nevsky. Vucic gave his guest a dog – sarplaninac (shepherd dog). 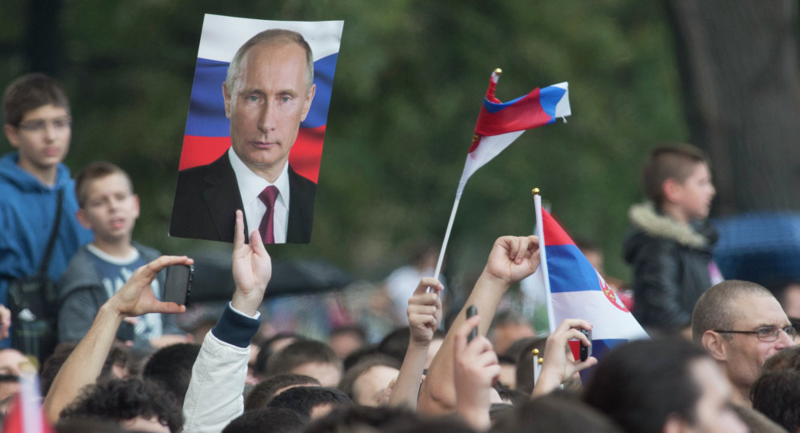 “The Serbian people will never forget what Vladimir Vladimirovic did in 2015, when Russia had vetoed the British resolution in the United Nations Security Council”, Vucic said, explaining that the resolution, when adopted, would label Serbs as “genocidal people”. “Therefore, we have a great responsibility for everything we will do in the future. Our two countries have good relations and we have significant possibilities to make our cooperation wider”, he went on. After their speeches, the delegations of the two countries held a meeting behind closed doors. As it was expected, more than 20 bilateral agreements and memorandums were signed, with a third of them in the domains of innovations and new technologies. Later today, Putin and Vucic visited the Saint Sava orthodox Church, in which construction Russia has invested significant funds in recent years. The two presidents were welcomed by thousands of supporters of the ruling Serbian Progressive Party (SNS) led by Vucic. Many of them came from different parts of the country on buses organized by SNS; From the towns of Nis and Krusevac alone, arrived about 100 buses. During the march towards the temple, some of them yelled “Aco Serb” and “Djilas thief”, alluding to president Aleksandar Vucic and opposition leader Dragan Djilas. In the first row of those who marched there was a banner with the inscription “1 of 300 millions”.